Eliud Garcia is a Texas native bass trombonist. Eliud holds a bachelor’s degree from Texas State University where he studied with Dr. Martin McCain. During his time at Texas State University, Eliud was named finalist for the Eastern Trombone Workshop (American Trombone Workshop), the Big 12 Bass Trombone Competiton and the Texas State Trombone Symposium. He was also selected as a competition winner for the Woods-Kone Scholarship and the Texas State Concerto Competition where he performed Eric Ewazen’s Tuba Concerto. 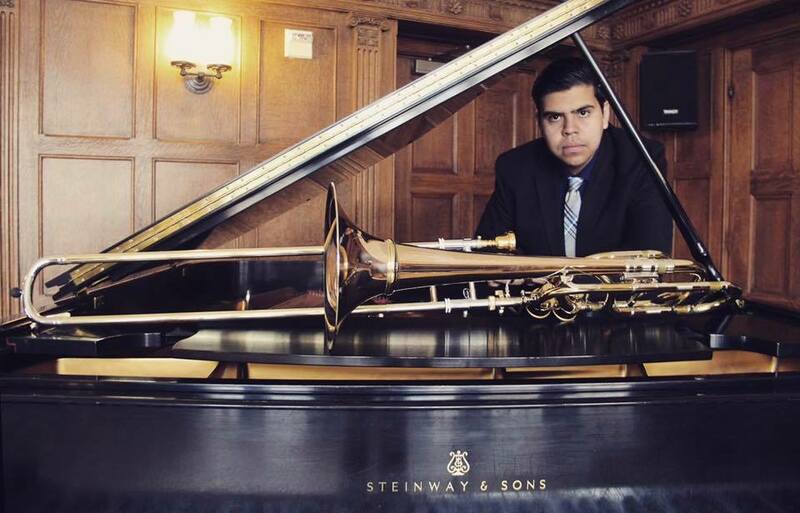 After completing his undergraduate degree at Texas State University, Eliud accepted a full ride scholarship offer to study at Yale University with the renowned trombonist of the Empire Brass, Scott Hartman. While at the prestigious institute, Eliud recorded his first pop singing album, Personal, where he collaborated with instrumentalists from the institution and of other music schools like Juilliard and Curtis in 2017. He later began to record his second album after releasing his debut first album on all digital platforms and becoming well recognized. His second album was recorded with the Puerto Rican music producer, Giovanni Crespo Medina, ex-music director of Elvis Crespo. In 2017-18, Eliud accepted to become a Yale University fellow for the Music in the Schools program where he taught brass students with financial needs in New Haven, CT.
Eliud has been invited as bass trombone soloist with the Collegium Musicum Academy in Pommersfelden, Germany where he performed the Vaughan Williams Tuba Concerto in 2018 and has participated in numerous recordings throughout his short career. He has also performed with numerous East Coast orchestras including the Greenwich Choral Society Orchestra, the Greater Bridgeport Symphony, Nutmeg Symphony Orchestra, the Eastern Connecticut Symphony, and other local symphonies in Connecticut. Currently, Eliud is the musical director of the Roma I.S.D. Fine Arts Orchestra and continues release versatile music varying from tropical cumbia, salsa and latin fusion.